Over 100,000 people are coming to watch the First Independence Day Parade in the Nation begin as the clock strikes midnight of the 3rd, and the Fourth of July unfolds in all its glory! 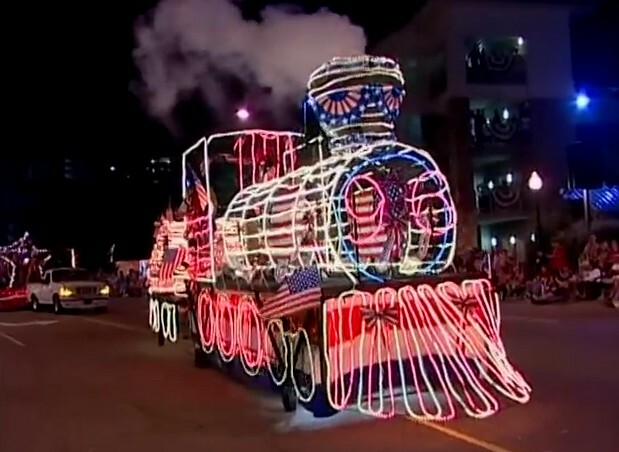 Gatlinburg has long been leading the nation with the first July 4th parade of the day, since 1976, when the town decided that 200 years without a midnight parade was long enough, and it was time for a change! And now in 2014 we eagerly look forward to the 39th year of this event. As the night draws closer on Thursday, the 100th Army Band (back again from last year and an awesome military band!) will offer free concerts from 2:30 until 5 pm at Ripley’s Aquarium. The parade is a large one, taking a good hour and a half to pass by. Patriotism abounds as the 100th Army military band provides marching music, with participation from all branches of the military. This year’s Grand Marshall is a true American hero, retired Army Staff Sergeant Heath Calhoun. The parade will be colorful and extravagant, totally impressive, with massive lighted balloons, and floats of all kinds. There will be music and joy in the air. But the parade is only the beginning of what’s happening this July 4th. Set aside a full weekend to recover from the celebrations in the area, because there’s a lot more that follows the midnight parade, in both Gatlinburg and Pigeon Forge. In Gatlinburg, hopefully after some sleep, wander over to the Little Pigeon River at Christ in the Smokies bridge on River Road at noon, and watch the start of the River Raft Regatta, a light-hearted event in which anything that floats can be sent downriver, with many prizes awarded to winners in this race. The finish line is at Ripley’s Aquarium – where you could simply hang out and wait for the glorious armada to sail to victory. You could also head over to Pigeon Forge, where the July 4th activities will be getting started around noon. Patriot Park is the venue and the celebrations begin with kids games and events, kicking off the 24th Annual Patriot Festival. Free admission, with fun and games, a Kids Carnival area, food vendors everywhere, and lots of great music starting up early in the afternoon. Several bands perform through the afternoon and evening, leading up to award-winning headline act Lonestar at night. 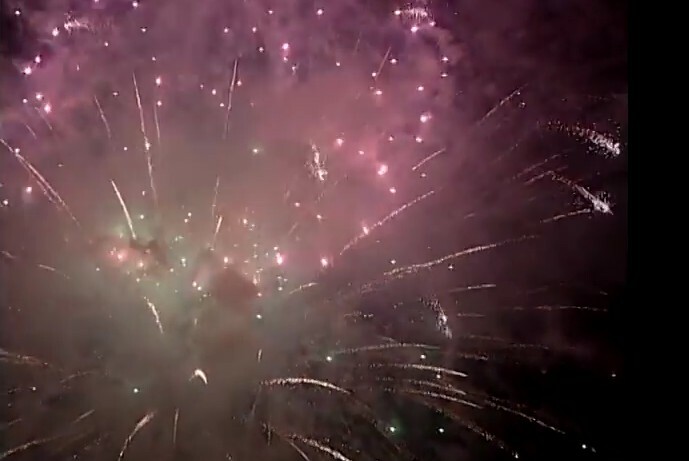 In both towns as the night falls, the time draws closer for the massive fireworks finales, around 9:30 pm in Pigeon Forge and at 10 pm in Gatlinburg. Pigeon Forge has a fantastic pyrotechnic show synchronized to country music, a perfect ending to a great patriotic day in the park. Gatlinburg meanwhile leads in with a free concert by the 100th Army Band at 9 pm and then at 10 pm lights up the downtown with its own brilliant and award-winning fireworks show, all to the music of the 100th Army Band. click these links for Gatlinburg and Pigeon Forge. Parking in both towns is best done in the city lots for free, and then riding the free trolley in Gatlinburg along Parkway and the free trolley shuttle to Patriot Park in Pigeon Forge. Driving between the towns – especially to try to see both fireworks shows – may find you caught up in lots of traffic, and sadly, you probably can’t be everywhere on the Fourth. But you can be MOST everywhere, and sleep after all is something you can catch up with on Saturday & Sunday!